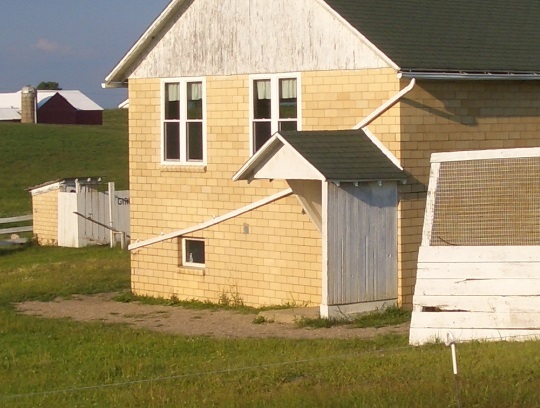 School starts tomorrow for Rebecca Miller, teacher at an Amish school in Holmes County, Ohio, and recently a regular contributor here at Amish America. That means we’ll be hearing less from her, since she won’t be working a job with regular computer access. However, I’ve still got several posts she has written to share with you. Rebecca also says she’ll still be able to check in occasionally here. 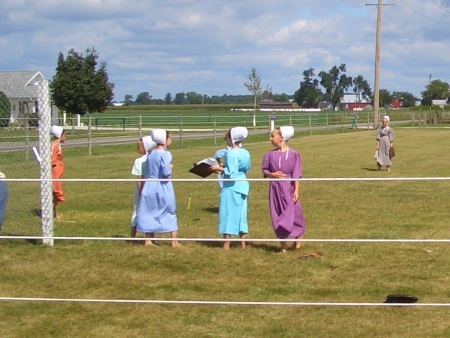 In honor of the school year starting, I asked Rebecca if she could write something on the things Amish children learn in school–not the 3 Rs, but those other, intangible life lessons that you don’t find in the textbook. Rebecca has taught school for 10 years. She also got input from an ex-teacher who taught 20+ years to write this post. Take it away Rebecca. I often tell my students, “If we all used the Golden Rule at all times, we wouldn’t need any other rules,” but since children are children they also need a few more specific guidelines. Though children memorize it in German and English, the most important part is learning to practice it in our everyday lives. So often even we adults forget to apply it in everyday situations. We do stress using the Golden Rule in play and any other situations. It wouldn’t be unusual to hear a teacher ask an offender,”was that the Golden Rule?” And then follow up with “please apologize.” Or a punishment if it merits one. This is a vital ingredient for any successful school. And it also applies to the teacher and the parents. Children need to learn to cooperate with the teacher and each other. There are several instances where it’s very essential. For one, planning and bringing together the annual Christmas program. The teacher puts in much effort to pick out parts for each student, then setting up the poems, plays, and songs, but if not for the students’ cooperation in studying and practicing our hard work would be for naught. Then there’s also a lot of work in cleaning, decorating, and getting the schoolhouse ready. A few other times would be special art/craft projects where the whole class or sometimes even the whole school work together. Another instance would be deciding what to play at recess. Perhaps the older boys want to play softball, the girls would rather play volleyball, middle grade boys might want to play soccer or rabbit tag. The little girls think skipping rope would be best. So since there are likely only 25-40 children we’ll need to come up with a compromise and maybe choose two things to play. Then everyone is expected to cheerfully play what has been chosen. Not only do children need to learn to respect their teachers, but also each other, and themselves. There is also a great need to learn to respect school property, the neighbors’ property, and each others’ space and privacy. All of these are much easier for the teacher and child if good ground work has been laid at home before they start school. But even the most respectful children can lose that respect if the teacher doesn’t maintain and teach it also. All children, even the ones with the best behavior need reminders. They also need praise for doing the right thing and showing respect. Since there is no janitor, students learn at a young age to help with cleaning and upkeep. I usually give each child a daily chore schedule, which also allows them one free day. For example on Monday Sara might sweep classroom, Tuesday help check workbooks, Wednesday clean the blackboard, and Thursday, free :). 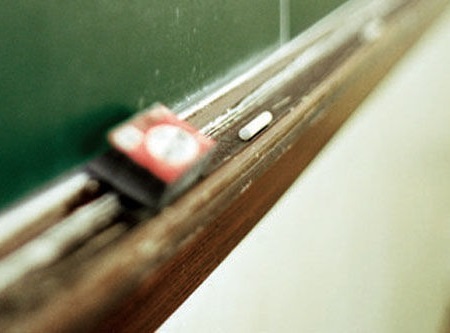 Younger ones might pass the trash can, wipe desks after lunch, clap erasers, sweep the basement. The older ones also take turns by weeks to put our hot lunch foods in the oven at 11 o’clock so they’re warm by 11:30, and guess what, if Johnny forgets one day- he probably won’t the next. He’ll get plenty reminders from his peers. No one likes a late lunch 😉 . On Friday afternoon we all help each other give the school house a good scrubbing and clean up the grounds. Older students will also have the opportunity to help younger ones with questions or studying spelling words, reading stories, or times tables to name a few. They can also help their teacher by taking classes or giving flashcards. They also need to be responsible for their desk and space. I might also send a few of the older ones out to pick up trash along the ditches. If you’re in a high-traffic area, you wouldn’t want to do that. They also learn at a young age to work independently and be responsible for their lessons and studying for tests. Last but not least, we have one of the most important of all. Again, as I mentioned before, if children are taught these values from home, it is much easier for the teacher. It is great if we can get them to obey out of love, and not only because they have to. If children only obey out of fear, sooner or later they will rebel and act out. Parental support makes a huge difference in this, but a lot lies on the teacher, too. Children soon learn if a teacher means what he/she says or if they can push things a little further each time and soon be doing exactly what they want to. Children need the security of knowing that obedience is expected. If they can learn these values at a young age it will help them all through life: as a church member, an employee or employer, a teacher, a parent or perhaps in the ministry. Like anything, the younger we learn something, the better it will stick. I’d like to close with a neat little poem that was in our Teachers’ Meeting booklet (written by an Amish teacher). a child of almost any kind. The good at bat and ball ones. The look just like their pappy ones. The very trying, poky ones. The laugh with all their might ones. The make their letters squiggly ones. The almost make you cry ones. The sitting on their feet ones. The like their stories creepy ones. The never, ever flurried ones. The never talk enough ones. I think… I’ll teach another day. So long, blessings to all! It apears that these young people are taking their Initiative skills seriesly! That should pass their Performace Reviews to please their Parents! Never would I imagine in Decades; that most of these young people seem to Cooperate with each-other! I, therefore; dealt that this is realistic in our English Worked! We need to Educate the English that by Cooperating: according to this article is for real; it’s not Holloywood! 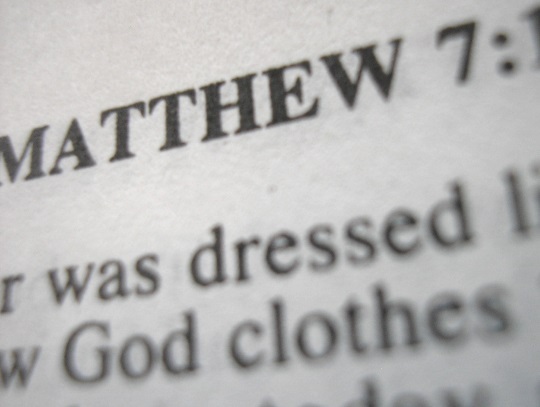 Probably everyone here knows the Golden Rule by heart, but just in case, here it is from the King James Version of the Bible: “Therefore all things whatsoever ye would that men should do to you, do ye even so to them: for this is the law and the prophets.” The above photo that illustrates Matthew 7!12 doesn’t show the Golden Rule verse. This list is a reminder of how great a responsibility the Amish community is willing to entrust to people who would, in the “English” world, be considered children themselves, the teachers, who in some places may be as young as fourteen. Even when you start clapping erasers in first grade (and probably gathering eggs from the hen house a lot younger than that), I am amazed at the maturity expected from and evidently achieved by some Amish teens. Trish you make a good point. And the level of responsibility that these children handle is a silent reprimand to the rest of the world that fails our own children by not teaching them (by example, instruction, and consequence) to live up to the same level. Trish, While some may be only 14 when they start as a Teacher’s aide, you will very seldom find parents who want to hire a teacher younger than 16. But for us older teachers even 17 or 18 seems young. I was 18 when I started and personally I think you should be a church member (and I know many Amish parents agree). They seem to take the responsibility more seriously then. I loved this posting!I plan on forwarding it to my daughter who began her career as a school teacher yesterday. What a wonderful way to view the learning process. I thought Rebecca did a great job. This was interesting and having been a teacher & school parent both I can say it’s accurate. Good job, Rebecca. Your first day of school is tomorrow, right? We wish you a successful school term & God’s blessings & guidance and you begin another term of teaching. Many thanks for your article, Rebecca–and for the poem. This teacher thinks … she’ll teach another day. Goodness, we are so blessed…. May your school year be full of adventure, discovery, and blessing upon blessing. Thanks for sharing this, Rebecca. I greatly appreciated it as I started my first term teaching in one of our church schools Monday (Aug. 24). I think I’ll post that poem in my room! Good luck in the coming school year! The same to you , Nicholas, best wishes ! What a wonderful post for this time of year! My teacher-daughter (5th grade, public school) started the school year just over a week ago; today, the local kids where I live began the new school year this morning. It doesn’t matter if the kids are in public/parochial/private/homeschool—kids are kids everywhere, and good teachers are good teachers no matter where you find them…you meet many on field trips and can tell how good they are! I will send this to my daughter. I’m sure she’ll agree with what Rebecca has shared here. From what I’ve read that Rebecca has shared, she certainly is on my “good teacher” list. May you have a productive, fun, memorable school year, Rebecca! Great article, Rebecca! Thank you for sharing. The teacher in me also loved the poem. I think I’ll post it to my wall. Best wishes on your new school year! I wanted to share that I thoroughly enjoy Rebecca Miller’s writings. 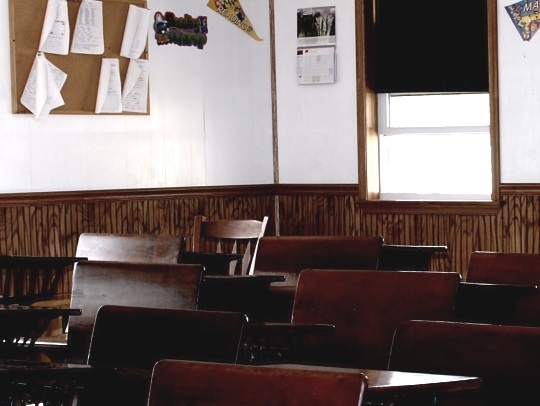 I recently used the poem entitled Variety that she shared at the end of her post, 5 Things Amish Children Learn in School, at a Retiree Dinner for educators. Though we had a crowd of teachers ranging from Elem to High School I prefaced it by saying the traits described can be found at every age educators deal with! The poem was well received! Before reading it, I asked them to shut their eyes and listen…..that I was sure faces and names of past students would come to mind. Thank you Rebecca for sharing the poem! Holmes county. They are the best friends that we could ever ask for in our life. 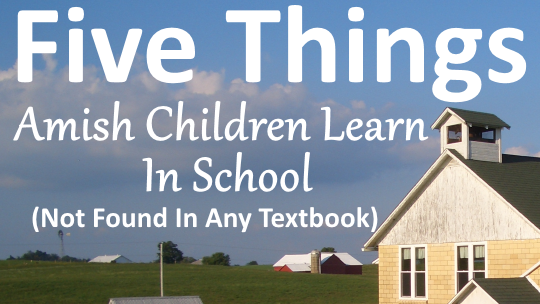 My question is this: what do the children learn from books in the Amish schools ?? I know that they learn a lot from their parents about respect, ect. Thank you for your time. Have a Blessed evening.